Happy first chocolate day of 2013. 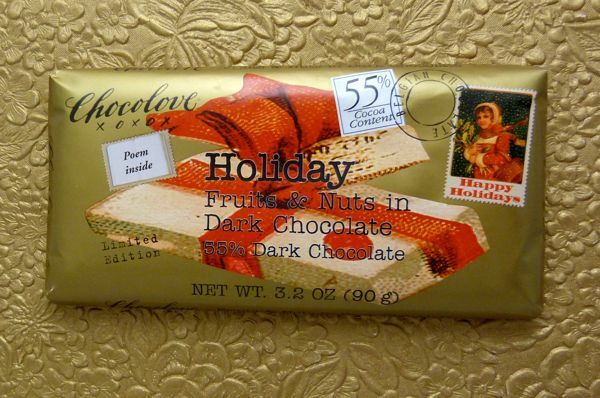 Today's Holiday Fruits and Nuts in Dark Chocolate bar from Chocolove (Boulder, CO) was a limited edition flavor; and I was lucky to find one late in the holiday season. The (55% Cocoa) bar was made up of 18 small, dark, glossy domes of Belgian chocolate fused together. 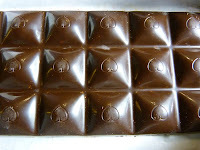 The chocolate base was smooth and firm, and easy to break apart -- a nice plus if you plan to share with others. The bar contained a nicely balanced blend of winter holiday flavors, like pecan bits, currants, dried cherries, walnuts, hazelnuts, and hints of candied orange peel and ginger. I'll try this bar with a cup of cinnamon tea (or Douglas Fir tea) later by a warm, crackling fire -- for the full holiday experience. No need for a book to read by the firelight, as this bar came with a love poem (below) -- inscribed inside the wrapper -- as is the custom for all Chocolove bars I've tried. Swift verses, streams of love, that hum and sing and merge. And, full of you, rush on, with passion overflowing. My friend, my dearest friend .. I'm your's ... your own. Today was Day #5 of Chocolate and Currants Theme Week, and Day #1 of Chocolate and Poetry Theme Week.